Warrior works as an engaging drama centered on the vicious world of mixed martial arts, but it ultimately taps out in the final round. Warrior starts out feeling an awful lot like Rocky and The Fighter. A good portion of that vibe comes from the East Coast, humble lower-class habitations of the main characters. And that vibe’s further amplified by the Philadelphia home of Brendan Conlon (Joel Edgerton, King Arthur). He’s a physics teacher by day and bouncer by night. Well, “bouncer” is the cover he uses to explain away his nocturnal activities to his wife. They’re strapped for cash, on the verge of foreclosure, and he’s gone back into the ring, taking on small-scale mixed martial arts matches that capitalize on his glory days in the UFC. Brendan’s estranged brother, Tom Reardon (Tom Hardy, Inception) is a marine who’s returned to Pittsburgh in search of shelter with their father, Paddy (Nick Nolte, Hotel Rwanda). Paddy’s a former drunk celebrating 1,000 days of sobriety. He’s found God, but both of his children have disowned him. Tom makes it painfully clear he’s sought him out solely for help in MMA training; Dad had been his wrestling coach back in high school. Tom has no interest in rebuilding their relationship and he hasn’t forgiven him for his drunken rampages and the abusive relationship Paddy had with Mom. It was a relationship so strained, Tom and Mom left for a life of destitution. The personal stories driving these three men, impeccably fleshed out by the lead actors, makes for a compelling, watchable drama. The two brothers each have something tangible to fight for, and their father also has reason to stand and deliver. As is typical of sports movies, there’s a big event to train for and that big event is going to serve as the movie’s climax. In this case, it’s Sparta, an MMA championship with a $5 million purse, to be held in good ol’ Atlantic City. This tale of two brothers gets set for a collision in the steel cage, with Brendan training in a rather sterile environment before taking it to the streets of Philadelphia and Tom enduring a thoroughly old-school Rocky Balboa training regimen of early morning runs and run-of-the-mill facilities. That inevitable climax is signaled early on in the movie, but as the various fights leading up to the big Sparta competition unfold, there’s an element of disbelief that’s hard to overcome. It’s the kind of implausibility that isn’t fun, it actually becomes a little aggravating. There’s a feeling of severe manipulation to get to that final match where Brendan and Tom square off in the squared circle. It’s a narrative choreography that requires the defeat of some major competition, including a Russian baddie who smacks of Drago in Rocky IV. Rooting for the underdog is one thing. Rooting for Brendan? Well, yeah, he’s a great, great human being, a loving father, a devoted husband, a much-beloved school teacher (cough, gag)... But... Dang. Countering Brendan’s Peter Pan-like rise to the top is Tom’s much darker story. He’s a loose canon who pummels his opponents in short order then storms out of the ring while the final count is still being made. From one angle, he’s a war hero and his story makes its way to ESPN. But he’s also hiding a secret that puts his wartime heroics in a different light. The unhappy relationship with his father is only one reason why he’s taken on his mother’s maiden name. So it is that Warrior turns into a punch-drunk mix of compelling drama and corny championship chasing that works as well as it does because the cast breathes conviction into the characters. 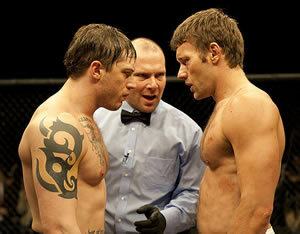 As painfully unlikely as Brendan’s surge is, Edgerton makes the character extremely likeable. He’s a guy worth cheering for, certainly, but not under such circumstances that strain credulity. Brendan’s wife (the knockout Jennifer Morrison, Mall Cop) is not only easy on the eyes, but she’s also easy to appreciate as a supportive wife who doesn’t simply retread Adrian’s trail. Haggard ol’ Nolte is also at the top of his game as the rehabilitated father who’s always teetering on the precipice of relapse. Then there’s Hardy, who plays dark and mysterious so very well. It’s been a pleasure to watch his star rise from Black Hawk Down 10 years ago to Inception last year. This is no exception. The media doesn’t catch on to Tom and Brendan being brothers until they are the last two standing and set to face each other in the final match, but even then they don’t follow the dots to Tommy’s trainer being their father. Sure, what the media does is really irrelevant, but the newfound breathlessness of the media putting the puzzle pieces together feels a bit like an emotional pile driver for those who didn’t pick up on the non-existent subtleties of the storyline.